Beaver statues are displayed in the garden at the Historic Garrison District in downtown Fredericton in New Brunswick, Canada. 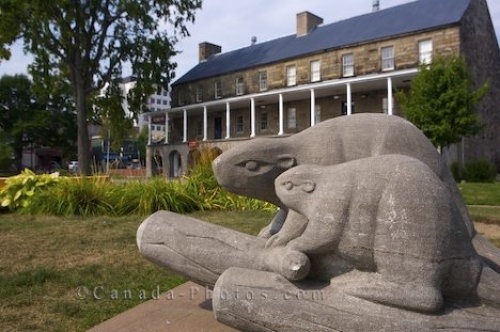 The Historic Garrison District in downtown Fredericton, New Brunswick is a place where you can relive history and these beaver statues are part of the decor. As you wander through the gardens these beavers are one of the many statues that are on display around the Historic Garrison District. Museum, Beaver Statue in the Historic Garrison District in downtown Fredericton, River Valley Scenic Drive, Highway 2, New Brunswick, Canada. Picture of statues of a beaver family at the Historic Garrison District in Fredericton, New Brunswick in Canada.